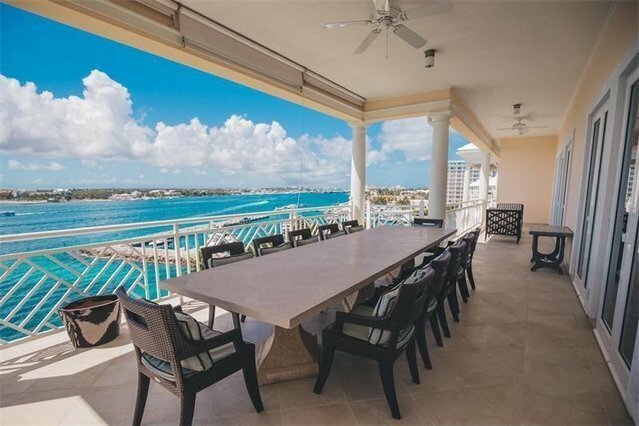 The epitome of sophistication and privacy, this harbour front penthouse offers a luxurious lifestyle within the gates of Ocean Club Estates. Private elevator access leads to the home's entry foyer and beyond to an expansive living room. Exquisite ocean vistas grace the interior, while hardwood floors and beamed ceilings complement its modern decor and neutral color scheme. A chef’s kitchen, sea view terraces off each of the four bedrooms, plus a relaxing entertainment area are further highlights. Residents enjoy a full range of amenities including a private marina, two on-site swimming pools, a fitness centre, on-site concierge, underground parking, golf & tennis privileges, an exclusive beach club set on world famous Cabbage Beach and VIP access to the facilities at the Atlantis Resort & Casino as well as The Ocean Club, A Four Seasons Resort.